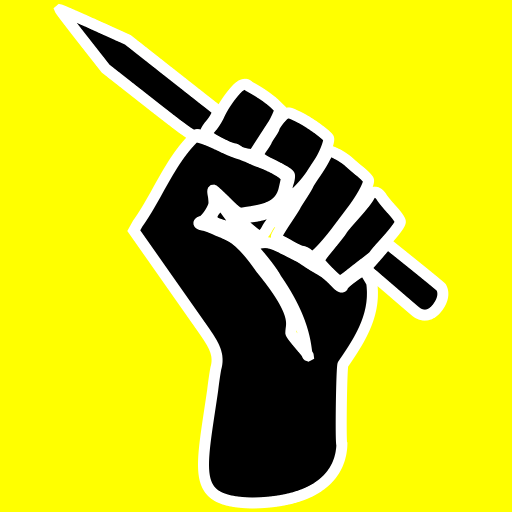 The replacement of a plan which had evolved from 15 years of charrettes, community workshops, work of high caliber design firms and planning by actual masterdevelopers with a study stitched together by a Tampa consulting firm ("Exceptional Service, Proven Results") with a hot needle for $79,000 to provide a fig-leaf for a Governor who is intent on undoing whatever his predecessor had done, is doomed to fail, no matter how you look at it. 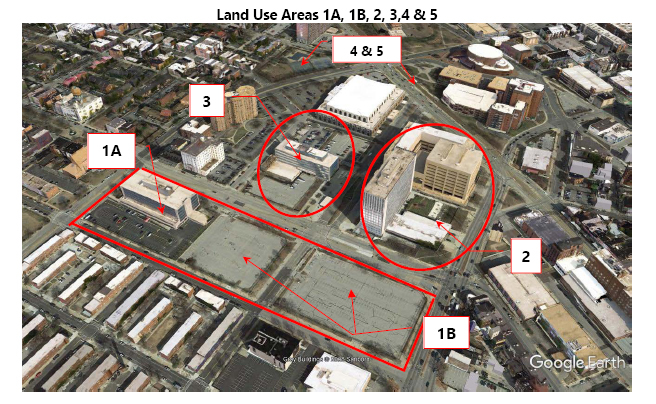 The new study was released Tuesday ahead of a hearing about State Center in Annapolis and is supposed to be "a fresh look" without consideration of anything done before. is the most ideal (sic!) location for potential commercial and mixed-use alternatives. 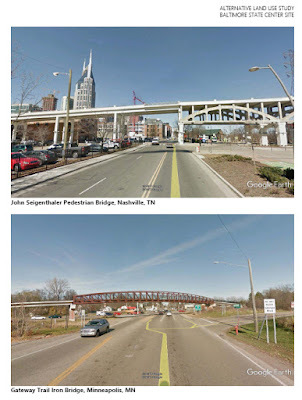 Even if one forgives the suggestion of pedestrian bridges to cross traffic arteries in a city that, just a few months ago, tore down yet another one of those pedestrian overpasses which have long obtained a status of being dinosaurs of transportation planning. mixed land uses primarily bounded by busy Howard Street and MLK Jr. Blvd. The option of pedestrian bridge access from surrounding neighborhood districts would provide a much-needed linkage and connectivity of the subject State Center Site to a large population and commercial/residential base to the east of Howard Street and to the south over MLK Jr. Blvd. A lot of the previous planning concerned itself with overcoming the isolation of State Center which is the result of misguided superblock-thinking of the past which generated ped bridges in the first place and thus exacerbated the isolation instead of creating greater permeability throughout. The study authors seem to be unsure that Baltimoreans can even properly imagine pedestrian bridges and helpfully list various "precedents" and even add really bad pictures to boot. Examples of pedestrian footbridge crossings are summarized in the table below. How very helpful! Performing additional due diligence and conducting a detailed real estate market analysis that incorporates direct market research to further assess gaps and feasible types of development to meet unmet demand taking into consideration DGS’ objectives for the State Center Site (e.g., creating/increasing jobs and economic activity to the area). Conducting a detailed transportation/traffic impact analysis. Conducting meetings/focus groups with area stakeholders and community groups such as neighborhood associations that could be impacted by future development of the State Center Site regarding their perspectives on the strengths, challenges, and opportunities associated with the current and potential future uses. Obtaining direct input from the outside development community which could be accomplished by testing potential market opportunities with the private sector through a formalized process such as issuing a Request for Information (RFI) that outlines DGS’ objectives including types of land uses and targeted economic/return on investment goals. Identifying a solid, sustainable redevelopment strategy including opportunities for public private partnerships as well as a realistic timeline for implementation. Yeah! Anyone who followed the State Center project over the years will recognize these steps, all of them have long been taken and the results are known to anyone who wants to look. 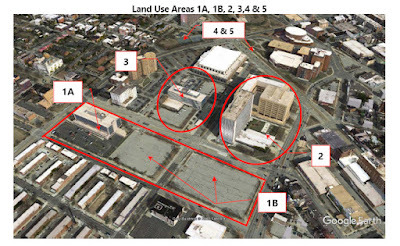 In the analysis of potential land uses for the State Center Site, the matrix that follows provides a summary of inventory within a 1 and 3-mile radii of the State Center Site. The purpose of this analysis is to recognize density of use and potential gaps of uses within the market area. The study of land use components in the 1 and 3-mile radii from the State Center Site is important because this represents immediate walking and/or short drive-time distance for potential user base. The population base within a 1-mile radius of the State Center Site is 52,278. The population increases to 302,982 people within a 3-mile radius equating to a 480% increase in population, all of which place varying demands on land use alternatives, summarized in the foregoing inventory matrix. There are several use categories that overlap from the 1-mile radius through the 3-mile radius. The various land uses are similar to the Peer City land use components previously discussed. 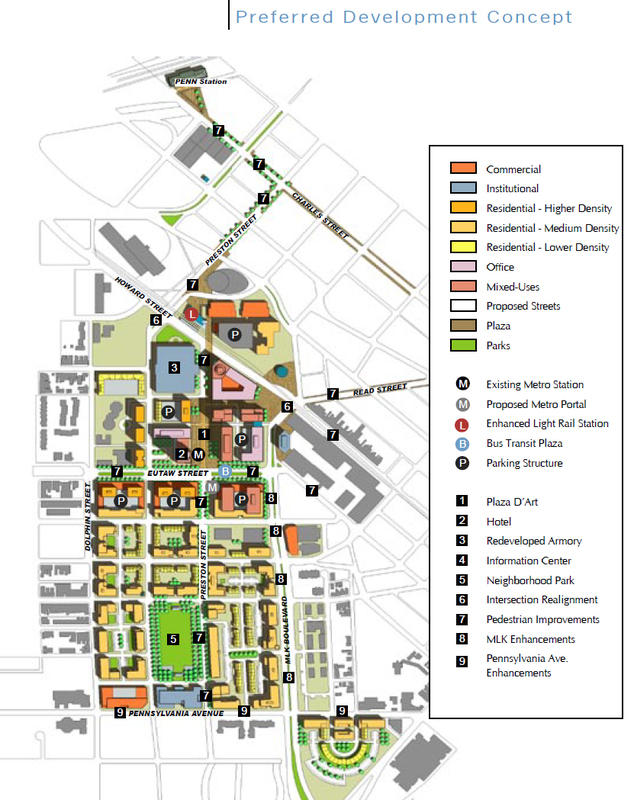 With such uninspired thinking it is then not surprising that the matrix of proposed uses marked as "highly likely" (whatever that means) includes a convenience store/gas station, the very abomination which the good people of Towson recently fought successfully to be built on York Road. 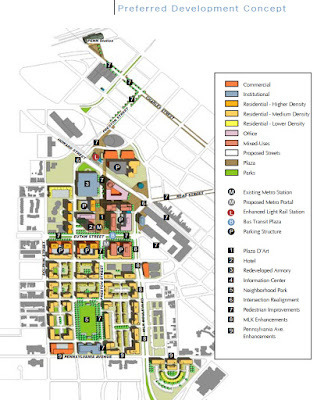 Other likely uses include a strip retail center and "university influence". These folks really love Baltimore! As all bad studies, this one jumps straight from a non-convincing "analysis" to even less convincing "solutions" and use proposals without ever drawing any substantial conclusions from the analysis, summarizing deficiencies, or developing guiding principles or goals. What to do with the State owned buildings? If so, what should they be used for? Where should the State put its offices? If not here then where else? If here, how could rehab or new construction be funded? Anybody who would investigate these questions in earnest would eventually come to a solution that would look quite similar to what Ekistics proposed: A public-private partnership in which the State as the largest land-owner and user would leverage its assets to stitch together an entire new neighborhood to heal a big gaping hole in Baltimore's heart. That wouldn't be the cheapest way for the State to get some updated office space, but it would be a responsible way for the State to be a property owner that is serious about economic development. The same Hogan who is willing to throw 5 billion dollars at Amazon is finding the leases suggested in the original State Center plan too expensive! Go figure! Mercifully, the study has only 116 pages and never advances beyond the level of aerial photography with red circles marked for various use districts. It is easy to conclude that it contributes nothing to the discussion about State Center, except the insight that the Governor's professed love of Baltimore is very, very shallow. Instead of a diamond and ruby he gave us a trinket from a bubblegum machine for Valentines. In the current White House language: Sad. At least there is no serious talk about an arena in this location. The dismissed developer was counting on the state paying $32 dollars a sq foot when all kinds of office space is available WITHIN THE CITY for less than $20. There is no need in this day and age to congregate 3,000 employees on on campus. The days of that being efficient because of shared mail room, copier room, phone system are over. This site should be de-populated and then made bare earth via demolition. at that point with a blank canvas developers will flock to build new taxable structures around exisitn mass transit. It was the intent of the proposal for revitalization that the State would leverage its assets to spur development that a pure market based approach would not yield. This included the lease buy back with rates that amounted to some level of subsidy. There are vastly different opinions out there about the fairness of the agreed upon lease-buy rates and whether there are options for the State to get space more economically. As an architect-planner I am not qualified to judge that but I can judge the overall benefits of comprehensive redevelopment that aims broader than finding the cheapest lease. In that the State acted as a responsible entity looking for best public interest outcomes not “the best deal” in the narrow transactional sense that is currently en vogue. A la Hogan: Viva la demolition! Is Amazon's slight the fault of City Hall?